Veggie 101: Speedy Spinach-Polenta "Pie"
I had high hopes for this recipe. I loved the idea of walnuts, feta cheese, balsamic vinegar, and spinach coming together for a sort of Mediterranean-inspired dish. I figured the polenta would make it nice and firm, almost quiche-like, especially with the addition of the cheese once it cooled slightly. My first bite was...good. Not what I expected. Strangely, it was almost bland, with the overpowering taste of the spinach. I didn't taste the balsamic, and only barely did I taste the tiny amount of nutmeg. The feta added a nice saltiness, but the walnuts almost seemed out of place. Did I not chop them small enough (the recipe called for a coarse chop)? Perhaps what I disliked the most was the texture: my first "wedge" that I cut completely fell apart (that being said, the picture above is a little misleading...). 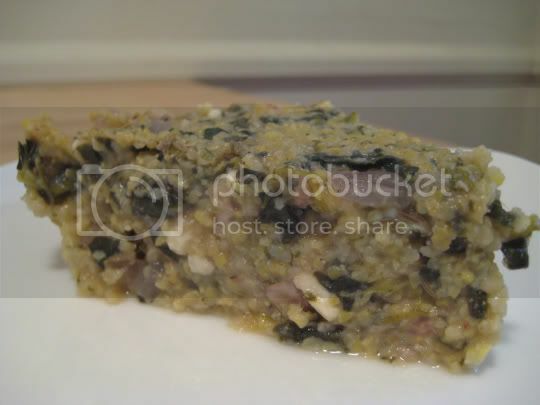 Once on my plate, I basically was eating a pile of spinach polenta, not the quiche-like treat I'd hoped for. I refrigerated it, thinking once it cooled it would be nice and firmed up. The next day, it had firmed up (hence my ability to take the picture)...but it had also gotten slightly watery (note the "wetness" in the pic). The bottom of the pie dish had a tiny amount of water visible...not very appetizing. The NEXT day after that, the amount of water had increased, now just making the "pie" look sloppy and nasty. Also, the taste had somehow changed. It was...disgusting. It almost tasted as if the red onions and feta cheese had spoiled in two days (in the refrigerator, nonetheless), and there was a strange aftertaste of rottenness. I ended up throwing the rest of it away. Make again? Probably not, unless I serve it the same day and don't fuss with the whole "pie" thing. Leftovers were not good.